Decorate your property for an artistic finish. Oasis Coatings – a perfect choice for architects and homeowners. Caters primarily to industries such as pre-engineered buildings (PEB’s), porta cabins, drums and barrels, scaffolding, fabrications etc. While the Oasis Deco range visibly lightens and brightens up homes, apartments and villas; the Industrial range focuses on customer’s assets with respect to performance and quality. The colour story continues with the Wood Coatings range. From the Oak to Amber to Birch to Mahogany Oasis, these Wood Coatings bring nature's best right into living rooms and office spaces. Oasis Assist consultation services and guidance will help you make the best possible decisions. Also, the Application division with well-trained painters are equipped to handle normal as well as specialist painting services, offering a one stop shop for Paint + Application. Contact us now to learn more about Oasis Assist. Everyone desires to stamp their individuality on their projects. But a balance needs to be achieved by seeking the right expertise. AGP has its own in-house Colour Consultant that ensures the maximum benefit from the Oasis Colour Spectrum based on client preferences, budget and the nature of the project. This service is available for conducting actual trials on the site (applying a sample patch on the substrate) to finalize the choice. Alternatively sample panels can also be forwarded for approvals. In case of large project tenders, free mocks ups can also be considered. Oasis has its own set of dedicated, trained and certified set of applicators that have been using Oasis range successfully over the years. They ensure quality and defect-free application at all times. AGP would be happy to provide the interface for customers who require suggestions and advice on choice of the applicator on demand. AGP provides computerized tinting machines which are synchronized with all product formulations so that the required shade is accurately matched at the dealer’s counter. Easy to operate and maintain, these tinting machines have different options available for the potential dealer. A full-time technical support engineer is also available. Oasis Assist includes a focused training capsule developed for training painters sourced by dealers (such as in house application teams for contractors) and paint applicators. These personnel are trained on how to correctly use/apply paints and coatings including the most important area of surface preparation. Oasis Assist’s portfolio also includes “Painter Meets”; events hosted by AGP for Product Portfolio introductions, new product launches for groups of painters from AGP’s key dealers which offers both assurance and support to the painter fraternity. We are a local manufacturer with progressive paint solutions. We combine quality and ethical conduct with local entrepreneurship. with uncompromising value and quality. Oasis is proud to go green with lower or zero VOC (Volatile Organic Compounds); recognizing sustainability should be at the heart of all buildings. Our choices of environmentally friendly paints and coatings adhere to strict industry standards, while delivering the premium levels of performance. Additionally the manufacturing process adopts initiatives like the solvent recovery unit, wind generating turbines etc. The intention is to work towards becoming a model green manufacturing facility. In a major win, Oasis Paints UAE got specified for the prestigious Royal Atlantis Resorts & Residences at the Palm. Sharjah Chamber of Commerce & Industry (SCCI) has formed a new Representative Committee of Industry Sector to promote business and to understand the needs, bottlenecks of the various industries located in Sharjah (including the free zones) as well as assist in solving them. Oasis Paints has achieved a signficant breakthrough in the northern parts of India through AGP’s latest export customer, Garg Paints. November, 2017 marked our debut participation at Downtown Design, the Middle East's only platform for trade professionals to discover original, high quality design from all over the world. The painting division of AGP has re-launched its offer of quality paints and painting services. Thumbay Clinic, Sharjah conducted a free medical camp for staff at Al Gurg Paints (AGP) on December 4 from 10.00 am to 1.00 pm. A total of 86 staff participated in this camp. In its quest to improve the servicing levels for small order quantities Al Gurg Paints (AGP) has installed and commissioned a new 10 HSP High Speed Disperser (HSD) for General Industrial customers. 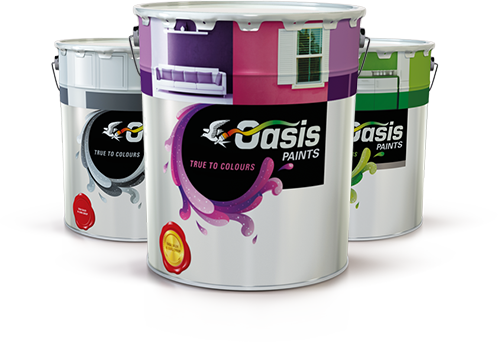 Al Gurg Paints (AGP) has switched over to new Oasis branding with the swish design feature as the basis for building the recall value. AGP's factory now has this new signage. The same image will also be popularized via the distribution channels. A large number of Al Gurg Paints (AGP) staff attended a fire fighting training conducted on Saturday September 27 by Dubai Civil Defence at the Dubai Police Academy. The training was conducted in compliance with the Ministry of Labour regulations. Al Gurg Paints continues to maintain its green credentials. Having won the Environment Performance Certificate (EPC) awarded by the Federal Ministry of Environment & Water in 2011, AGP was once again awarded the certificate for 2012 in recognition of sustaining its environment efforts. Al Gurg Paints (AGP) participated in the recently held ‘Made in Sharjah’ exhibition held at Expo Centre Sharjah from December 17 – 21, 2012. AGP showcased its OASIS range of Decorative and industrial products; LEIGH’s Range of Industrial coatings and KANSAI range of Auto Re-finish.